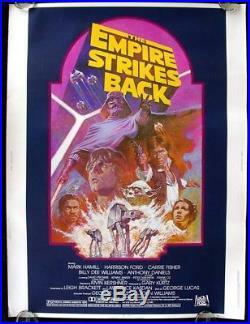 ORIGINAL ROLLED near mint-mint unused 30"x40" movie poster of EMPIRE STRIKES BACK R-82, Re-issue 1982. Heavy stock same as a 14x36 or 22x28. Hard to find poster size stopped production approx. For UPS insured in a sturdy tube. A FEW FACTS TO HELP EXPLAIN WHY I HAVE SO MANY MINT ROLLED ORIGINAL MOVIE POSTERS FROM THE 1970S & 1980S & 90s & folded one sheets, other sizes, Lobby Card sets etc. I HAD A LARGE MOVIE POSTER COLLECTORS STORE IN CLEVELAND OHIO FOR 18 YEARS, OPENING IN 1978. UP UNTIL 1992 MOST TITLES WERE PRINTED AT THE CLEVELAND NSS PLANT 3. I WAS A RETAILER AND MAJOR WHOLESALER FOR 20+ YEARS INCLUDING THE MAIN VOLUME DISTRIBUTOR FOR ALL OF KILIAN ENTERPRISES PROJECTS APROX. 25+ POSTERS, MOST LICENSED FROM LUCASFILMS. ALSO HUNDREDS OF SHOWS & HUNDREDS OF QUANTITY TRADES WITH MAJOR DEALERS. HOPE THIS HELPS ANSWER SOME QUESTIONS particularly about authenticity and the wow this seems too good to believe remarkThanks, Randy. Powered by SixBit's eCommerce Solution. The item "EMPIRE STRIKES BACK R-82 ORIGINAL ROLLED 30X40 UNUSED MOVIE POSTER STAR WARS" is in sale since Friday, April 27, 2018. This item is in the category "Entertainment Memorabilia\Movie Memorabilia\Posters\Originals-United States\1980-89". The seller is "bradburied" and is located in Strongsville, Ohio. This item can be shipped worldwide.